When people hear I’m gluten free they often think I am on a mission to lose weight or that I just got hooked into a new fad diet. So, before I start, let’s get one thing strait:I would never willingly give up bread. Ever. For anyone to think I would give those up for a fad diet or to lose weight are crazy! If you think you might be struggling with a gluten intolerance, check out what symptoms lead me to realize I had an intolerance. Well, besides having to give up bread, the major problem people often face when going gluten free is trying to afford it! It’s true there are more gluten free options available than there were years ago, but they generally come with a price bump. 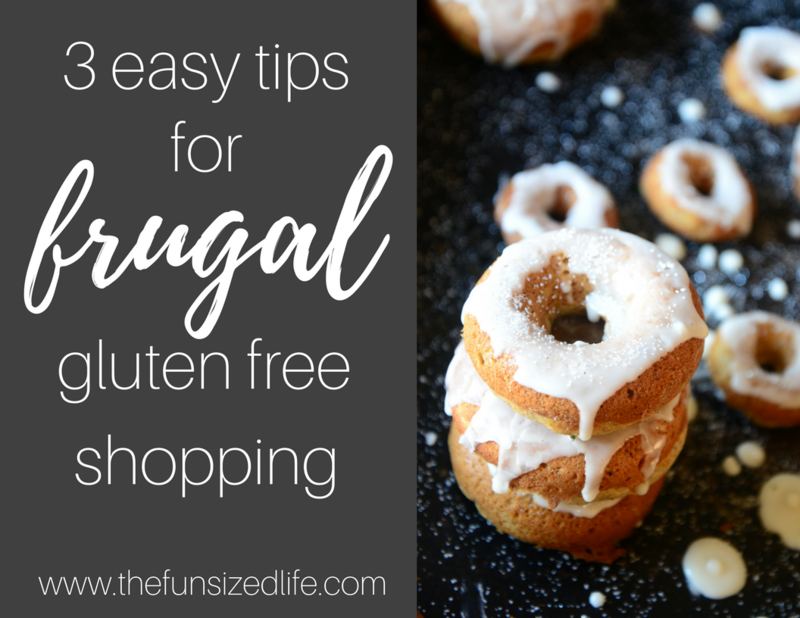 I have three major tips to share that will help you stay frugal while gluten free shopping. The best way to save money and still enjoy eating gluten free is to start collecting recipes that you can trust. There are a ton of great gluten free options out there as far as cookies, donuts and cakes go but often times it’s far less expensive to just make some at home. Not to worry, I have tons of recipes to get you started! My personal favorite gluten free mix for creating gluten free recipes at home is Bob’s Red Mill Gluten Free 1 to 1 Baking Flour. This is the best way to get yourself started when going gluten free because this mix is an easy substitute for flour. Lately I have really taken advantage of creating all my old favorite’s using this baking mix. Lucky for you, I am a firm believer in sharing! When you are ready to get a little bit healthier and a little less processed, the most common way I create gluten free foods is using Bob’s Red Mill Gluten Free Old Fashion Rolled Oats. Using these oats you can create tons of breakfast foods or even just blend the oats to create a simple gluten free oat flour. There are a ton of speciality stores that offer gluten free products, but it’s also becoming easier and easier to find gluten free goodies at your typical, everyday stores like Target. Personally, Target is my favorite place to get my hands on gluten free treats. You can usually find discounts on Target’s Cartwheel app for things like cookies, crackers and other gluten free snacks. On top of that, I will check my Ibotta app to see if there are any additional refunds I’m able to get. For more information on Ibotta, see my full review and tutorial here: Target Hacks: How I Made Money at Target. Again, at Target, you are able to use your 5% off discount when you use your Target Debit Card. Finding stores that have multiple ways to save is always a smart idea when trying to stick to a budget while eating gluten free (or any other diet for that matter.) To save additionally on your groceries, there are online sites like BeFrugal.com that allow you to search a wide variety of coupons and you are even able to shop online if you prefer to have everything sent right to your door. BeFrugal works a lot like Ibotta in the sense that you are able to get cash back on our purchases including Target. This is totally confusing, I know. To avoid over-spending on gluten free products, you can create recipes at home with oats and four blends or you can just forgo the grains all together. There are so many gluten friendly recipes you can use that don’t involve using flour or oats of any kind, are still easy to make and incredibly tasty. At the end of the day, just remember, you got this. Take it steps at a time and take advantage of all the money saving items that you can!